Jean-Benoît Nadeau and Julie Barlow spent a decade traveling back and forth to Paris as well as living there. Yet one important lesson never seemed to sink in: how to communicate comfortably with the French, even when you speak their language. In The Bonjour Effect Jean-Benoît and Julie chronicle the lessons they learned after they returned to France to live, for a year, with their twin daughters. They offer up all the lessons they learned and explain, in a book as fizzy as a bottle of the finest French champagne, the most important aspect of all: the French don't communicate, they converse. To understand and speak French well, one must understand that French conversation runs on a set of rules that go to the heart of French culture. Why do the French like talking about "the decline of France"? Why does broaching a subject like money end all discussion? Why do the French become so aroused debating the merits and qualities of their own language? Through encounters with school principals, city hall civil servants, gas company employees, old friends and business acquaintances, Julie and Jean-Benoît explain why, culturally and historically, conversation with the French is not about communicating or being nice. It's about being interesting. 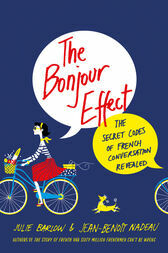 After reading The Bonjour Effect, even readers with a modicum of French language ability will be able to hold their own the next time they step into a bistro on the Left Bank. JEAN-BENOIT NADEAU and JULIE BARLOW are the award-winning authors of The Story of French, The Story of Spanish, and the bestselling Sixty Million Frenchmen Can't be Wrong. They live in Canada.